Using the 'better' weather for an opportunity to visit some of the smaller caves we opted on the Sunday to head to the Parish of Ystradfellte and to the common land that overlies the passages of Little Neath River Cave and overlooks the Nedd Fechan valley below. We parked in the centre of Ystradfellte and headed up the lane to the common in a light mist in search of a shrubbery. With a wide entrance reminiscent of the Cave of Caerbannog we approached with caution, knowing of the tales of the killer rabbit we clutched our Holy Hand Grenade of Antioch and approached with trepidation. Fortunately the killer rabbit was not resident having gone to visit the cheese shop in the village. The large entrance chamber is open to the outside and acts as a sheep shelter, the floor liberally covered with a thick layer of evidence. At the back of the chamber a crawl through leads to a second chamber with mounds of red sand in the floor. From this Jess followed a long low passage on the left until it eventual ended in an old dig. We then turned our attention to "F.B. Chamber" not sure what the F.B. stand for but maybe Frank Baguely or Fat Bas@@@d?? The route to this was a flat out tight crawl with a "hump back" of rock in the floor. We all tried but non could pass to we then headed out to have a look at Ogof Gwynion No.2 a short section of low passage ending after 20m. The weather has now improved as we walked around to find Ogof Shar Wlad, neatly hidden at the base of a small quarried face of rock. We lifted off the covering rocks from the entrance and dropped down the entrance shaft taking care not to dislodge rocks onto those below. 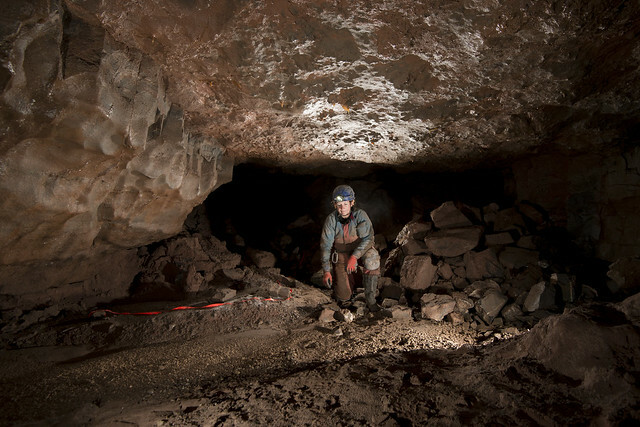 This is a very short cave, much shorter that the survey gives an impression of. We explored all passages including the "Main Passage" which is a steeply descending scree slope that is reached via a flat out crawl that provides entertainment as you speed down head first. The final cave of the afternoon was Ogof Dan Y Rhedyn - The Cave Below the Ferns. We lifted the covers off the shaft and rigged a ladder and lifeline off a combination of natural belays and the rusty scaffold bars across the top of the shaft. 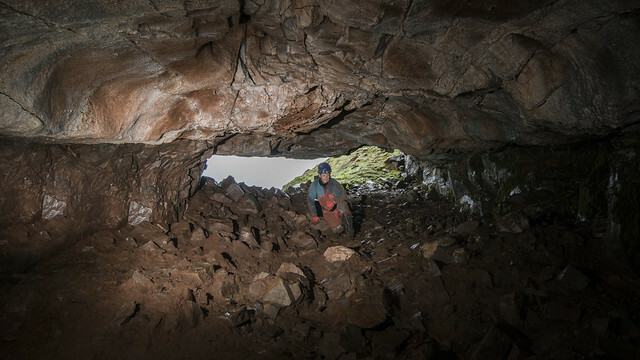 The whole shaft is loose and at the bottom it lands at the top of a large scree slope. We headed down to meet in the main chamber of the cave before we split up and headed in different directions to explore the cave. Half an hour was spent exploring all the cave including a flat-out dig in the downstream end of the cave that appears to be longer than shown on the survey. On heading back to the bottom of the entrance shaft we found Jess with what she insisted was a DEAD FROG found in this very establishment not an hour ago. 'E's just pining for the Fjords' she was told. 'E's not pinin'! 'E's passed on! This Frog is no more! He has ceased to be! 'E's expired and gone to meet 'is maker! 'E's a stiff! Bereft of life, 'e rests in peace! If you hadn't Trod 'im to the Rock 'e'd be pushing up the daisies! 'Is metabolic processes are now 'istory! 'E's off the twig! With Jess dropped off in the Brecon’s I continued on to meet with Brendan at the SWCC hut where we intended to collect a key for our objective of the day, Tooth Cave in the Gower. Brendan assured me that he was just trying to put us off and that he didn’t recall an excessive amount of crawling, so off we headed. 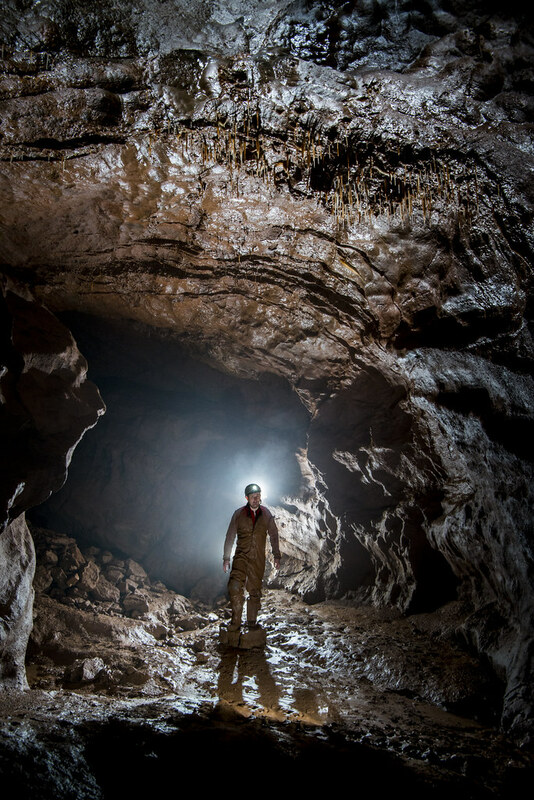 At just over one and a half kilometres Tooth is the longest cave on the Gower. The entrance is a large gate at the foot of a small cliff which leads via a slot to the head of a short pitch. We swiftly rigged and descended in to Bone chamber and followed the obvious route which soon degraded in to…….yep you guessed it crawls! We passed the Elephant’s Legs formations and continued through crawls filled with cobbles, with the occasional respite of stooping passage. Eventually we reached Big Sump which after the dry winter we’d had allowed us access to the downstream section of the cave and much larger passage way. We continued on to the rift passages which create something of a maze at the end of the system before retracing our steps to photograph the ‘Christmas Cake’ formation, impressive rift and stream passage and deeply scalloped tubes on our return. The crawling seemed even longer on the way back out and after a quick divert to take a look at the upstream section we headed out. Whilst changing I picked out small cobbles which had trapped behind my kneepads, massaged my aching knees and looked over to find Brendan stretching out and doing the same. We had to admit that Peter had been right about the crawling at least, with small bruises starting to form we knew we’d be suffering ‘Tooth’ ache for a couple of days to come! After a lovely night’s sleep at the campsite (my air bed turned itself in to a ground sheet), we set off for Craig y Ffynnon. I appeared to have somehow been nominated leader, think Chloe organised that , though she kindly opened the renowned awkward lock for me, annoyingly very easily, can’t be that bad I thought. I led the way towards our intended destination the promised land. I got to the 2nd boulder choke but couldn’t remember the way on left or right? Then Brendan hinted trying looking up! To thank him I offered to take the tackle bag (with ladder & rope that we’d need for the pitch in to the promised land), up through the choke. All up through the choke, we were greeted by a blank hall of mud which everyone got through without ending up in walking in wet socks. At some point this became travertine passage & we went over the gower pools, pausing to look at the formations, fortunately or unfortunately neither Mark or Brendan had brought camera, so we continued on to the impressive hall of the mountain king. 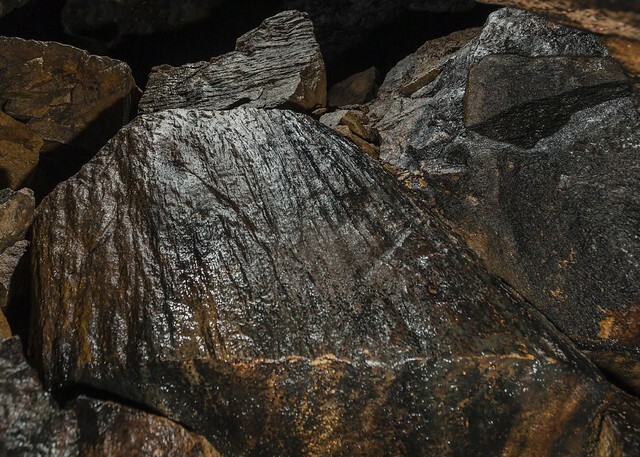 Lighting angles and no of flash guns were discussed, before making ur way to bypass 3rd boulder choke. Then some crawling and some more crawling followed by.... guess what??? more crawling! It was a lot longer than I remember, as had I remembered I won’t have offered to take the bag again. Finally on to walking passage towards 4th choke. At some point it was discussed that we’d change our destination to Heligtitie passage as time was getting on and people were feeling tired. 1/2 way through the 4th boulder choke Bonner and Marc were feeling the effects of Andy G’s Aggy trip, Brendan volunteered to go back with anyone who didn’t want to continue, so Bonner & Brendan headed out to enjoy the nice crawling sooner than the rest of us, but did take the bag! Out choke 4 we got in to walking passage and big chamber filled with dry mud covered boulders, but soon to come to the start of some formations which develops in to the stunning heligtite passage. Even though I’d been before I’d forgotten just how beautiful it was, which apparently is easy to do, isn’t it Jess? Marc was pleased he’d slogged on to see the passage, I think with the help of a supermarket energy drink called “I can’t believe it’s not Lucozade”! We made good progress out, I only went wrong once coming back through the 4th choke but otherwise uneventful, apart from playing a bit of stuck in the mud where Chloe tried to lose a welly which had the rest of us (well me anyway) in stiches. The mud assisted the slide back through the 2nd boulder choke and we were soon back at the junction to the north west inlet for a bit of a swim to remove some mud. At the exit Mark suggested I should try doing the lock, can’t be that hard right? The others carried on down the sunny hill side, Mark & I stayed in the shade & breeze of the cave mouth, while I faffed with the lock eventually getting it closed & able to remove the key. We then got in to the sun, but just as I started to defrost I realised I’d left my car key inside the cave entrance! Back up the hill I went in to the cold draft, I think I invented a few new swear words trying to get the pesky padlock undone, finally got that off but couldn’t get the corroded bit of bent bar out the hole in the door, I eventually got it free with the help of more swearing, car key retrieved, all I had to do was lock the door again! I managed this using the element of surprise, turning the key & removing it in one action. By the time I got back to the cars, Chloe who was car sharing with me, had changed out of her wet caving gear and had been lent a towel by Mark. This would have been a rather unusual site for any non-caver passer by; to see a lady in a towel and a load of blokes standing round in a random layby! Lol. Although I’m not sure it would be the first time we’ve baffled the locals with our strange dress sense and probably won’t be the last either! After following a rather long diversion as the Heads of the Valley road from SWCC was closed, I arrived half an hour late to the Daren Cilau car park to find Rich, Mat, Ian and Phil just finishing changing. I told them to head off and I'd catch them up as I know Mike and Andy's party would be already at the entrance waiting, and begun to kit up. Half way down the track I managed to catch Phil and Ian and together we continued to the entrance to meet up with the other party. Andy and the others were sunning themselves waiting for us and we begun to sort out who was going with whom. It was only then that we realised that Rich and Mat were missing. We knew straight away that they must have wound up taking the path which would drop them down the valley and much shouting and whistle blowing began until they eventually emerged. Rich had originally planned on the inner circle trip but was tired out by the climb back up the valley and elected for a slightly more subdued trip with the rest of us. Our group of six plodded through the entrance series to emerge in Barons chamber after around an hour. We then begun to head down the stream way, but it was all getting a bit much for Pete who hasn't caved for some time. We adjusted our plan and decided we'd head to the music room instead along with a quick visit for the cliffs of dover for most. 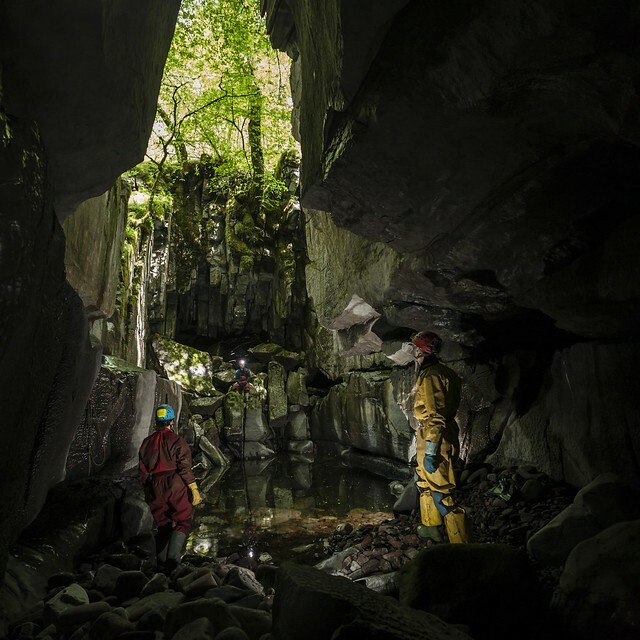 With two groups going into Agen Allwedd we decided to have a small group pay a visit to two of the more aqueous sites in the Clydach Gorge. We parked up near Ogof Craig A Ffynnon, meeting up with a group from the Chelsea S.S. who were heading into OCAF. We changed and then walked up the road to where the Old Drum and Monkey pub used to sit and walked down and through the underpass. We headed down past Ogof Capel and then crossed Nant Clydach to reach the inlet on the opposite side. After a couple of hundred metres we arrived at the entrance to Shakespeares Cave, where Chloe and Loz took the lead. The water was low, but still rather chilly and we didi not hang around as we made our way through the wet sections of the cave. We took a look at the sump before heading back to the Stratford Bypass and onto the Fifth Duck. Brendan had an issue getting his legs around the bend beyond the duck so the water babes continued to the end of the cave. We reunited and then made our way out the cave looking at one side inlet as we exited. With the first cave of the day under our belt we headed back to the cars, had a refreshment break and then headed to Ogof Craig A Ffynnon. Once in the cave we made the short journey to the start of Northwest Inlet where the aqueous fun starts. Up to our necks in water we waded through and followed the passage for a few hundred metres, the water getting shallower as we went. We were soon out of the deep water and the passage changed character to be large and tall with several areas of formations. Eventually we arrived at the impressive dig, with its own railway at the end of the passage. We followed this Indiana Jones style until we had seen enough collapses and loose parts to put us off going any further. On our way out we met up with the Chelsea group washing off in the deep water at the start of Northwest Inlet. We then headed back to the campsite to get set up for the evening. Chloe was able to get her pop up tent erected quick enough to shelter her from the thunder storm from where she could watch Loz and Myself getting drenched putting up our tents. On our second day we decided to head out west from our base at SWCC. Our target was Ogof Pant Y Llyn located above the only turlough in the UK at the Carmel woods in Glan Gwenlais. Although only a little over 20 miles from SWCC the drive was quite long and we arrived on a gloriously sunny day. 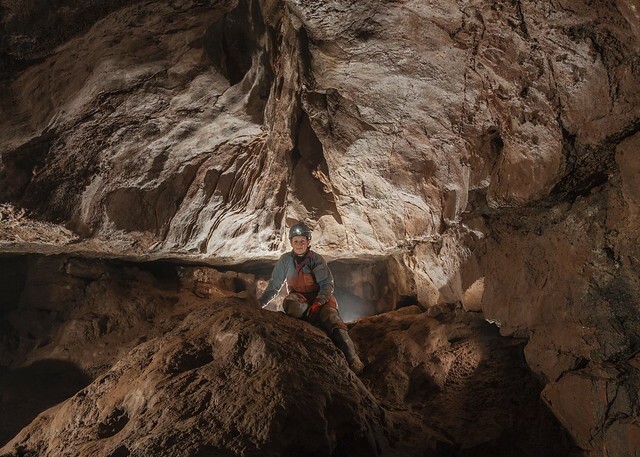 We changed and headed to the cave, our first aim to locate all the entrances in the immediate area. 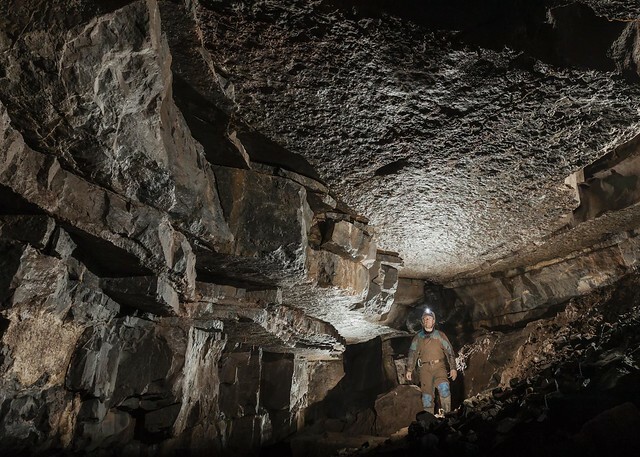 There are six cave entrances with three of them connecting into Ogof Pant Y Llyn, each linking into a different level in the cave. We started with the top entrance which has a cosy squeeze at the bottom of a steeply descending entrance passage. Mark tried to enter this feet first but could not make it past the tightest spot. We decided to go in via the most straightforward entrance, the large Lower Entrance. 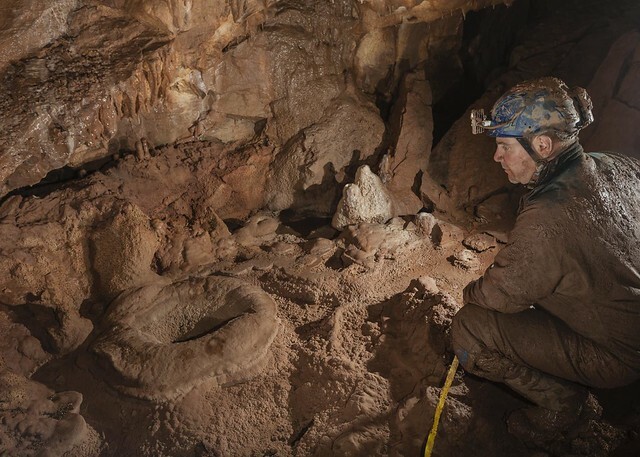 At the back of the short section of large passage a duck is found, formed in the u bend produced by the digging out of the mud to gain entry to the cave. 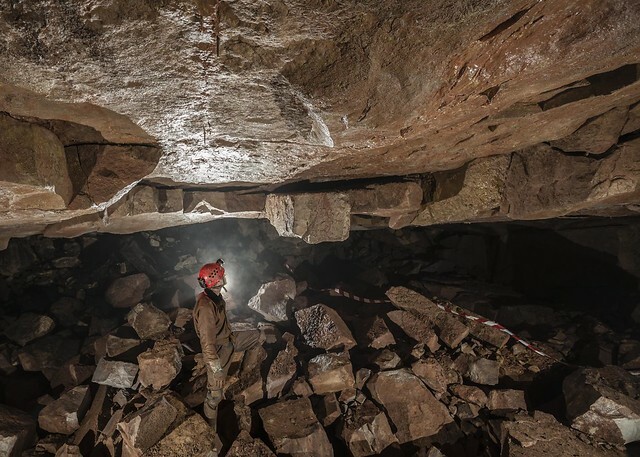 Once through the duck a clamber over boulders this led into the top of a steeply descending bedding chamber, with much loose rock on the upper slopes. 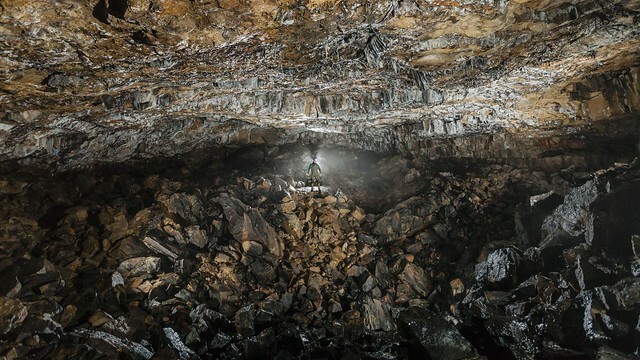 We descended following the obvious route until we reached the bottom of this chamber. Here a climb up of about 3m took us to a higher level where a passage headed down dip past some formations to a climb up to a dig. Going the other was we ascended a very muddy steep tube to reach an area of breakdown and a horizontal slot with a half tube in the roof above giving us access to the Upper chamber above. 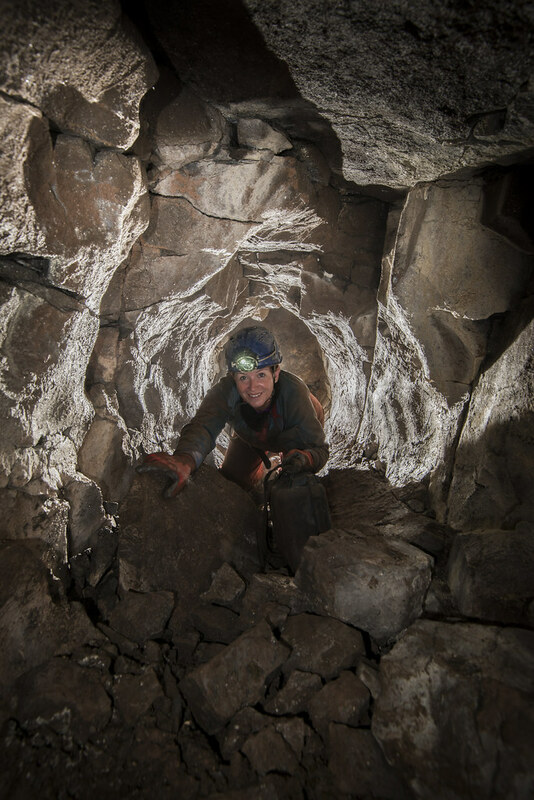 Although very muddy in the lower section, as we headed upwards this chamber became more pleasant. We headed to the left through the appropriately named Totem Passage and then descended into a section of massive phreatic passage out of character with the rest of the cave. A low silted crawl at the end had to be dug out to get into Disappointment Chamber that had a tall aven leading off. 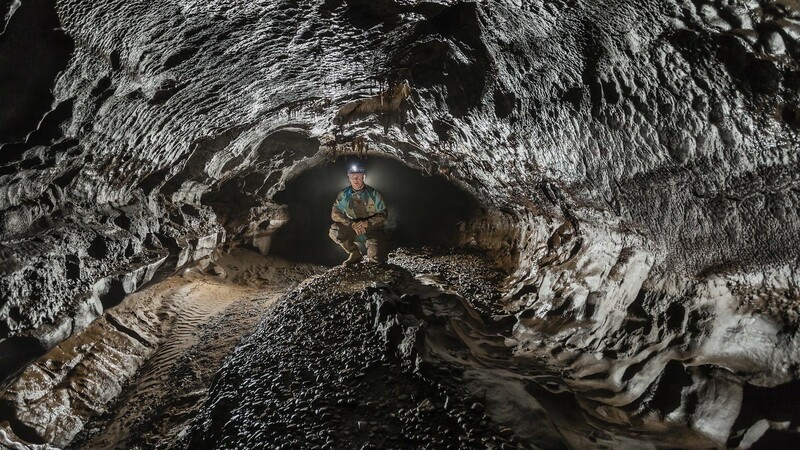 We took photos on the way out and then looked for the Upper Entrance connecting with the Upper Chamber this was easily found and Mark decided that he preferred to go out the horrible squeeze than retrace our steps through the rest of the cave. Once above ground we headed to the new entrance and Mark followed this to connect to the main route in. After a good meal and a couple of of Birthday drinks Chloe returned to find her blow up mattress had sprung a leak, and so she managed very little sleep, even with the aid of a bottle of sambuca she and Mark2 had night capped with. We tried to wake her with a good breakfast at Betws-y-Coed before heading to Go Below to pick up a key for Cwmorthin. Mark2 would lead us today as he was the only one who knew his way around and a sterling job he did too. Mark rigged a 50m rope in dropping us down an impressive chamber to level D. From here we went up a level to our first zip wire. This had a single plank in to nothingness and was a rather intimidating start to our fun. After this the zip wires became more fun as we begun to trust in the well installed underground playground which Go Below have created. Again we played on bridges, traverses and further zip lines for a couple of hours. After descending a particularly awkward and slippery traverse and bold pull through we reached a via ferrata route. Mark and I headed up to find a further Zip line and awaited the girls. After a while we realised that Chloe seemed to be taking rather a long time and returned to find her damp eyed and quivering lipped clinging to a metal rung. She had found the spacing a little too reachy for her and was really struggling to get off at the head of the pitch. Mark2 gallantly came to her rescue and assisted her up the last part. Well it isn't a 'proper' birthday trip without a tear from the birthday girl! All that was left was to head for daylight. Chloe and Jess exited via the normal entrance whilst Mark and I went to take a look at the smoke flue. Many thanks to Mark Burgess who was an excellent leader, also our thanks to all at Go Below who were very friendly and helpful, they have spent an awful lot of time and money on their routes and they are indeed very impressive. Hopefully next time Chloe will get more sleep before such a physical adventure as at one point she was heard to exclaim.....'This IS mining hell! After the obligatory breakfast in Luigis we first headed to Twll Clogfaen where we parked up, checked we could open the cover OK and then changed. We descended down the most impressive of digs, as it twisted and turned as it made its way down through the gritstone and limestone boulders. A massive amount of well installed scaffold had gone into securing the entrance shafts. Soon we reached the sound of the stream ahead and followed it down to the top of the first pitch where a fixed ladder took us down the 4m wet pitch. At the bottom an area of well taped formations was passed on the right before the stream was followed the short distance to the head of the second pitch. Here the water cascaded down the 8m deep pot, and a scaffold ladder allowed us to descend. On the far side of the chamber a calcite flow cascaded down the wall giving this a remarkable feel. At the bottom the way on was a low crawl which set the scene for most of the rest of the cave. A long flat out crawl lying in water and crawling over small rocks followed for some distance until the passage relented a little as we reached a junction. We first headed down stream to eventually reach the end as the water disappeared under a thick shale band. We headed back to the junction and then followed what was another stream inlet to reach the bottom of an impressive and tall aven. We now headed out taking a couple of photos on the way. 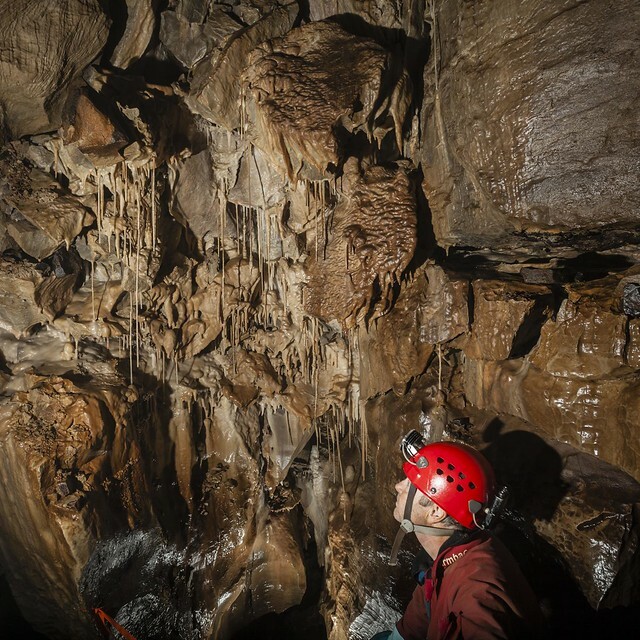 We were impressed by the cave, one that is uncharacteristic of the area with its clean washed passage. 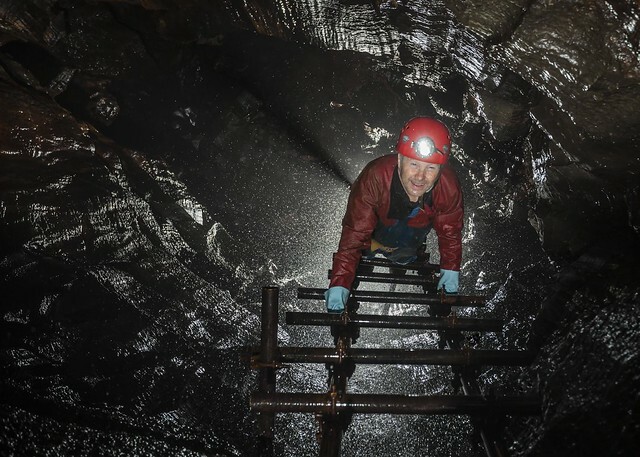 A short but fun trip, we were after all in Caving Heaven. 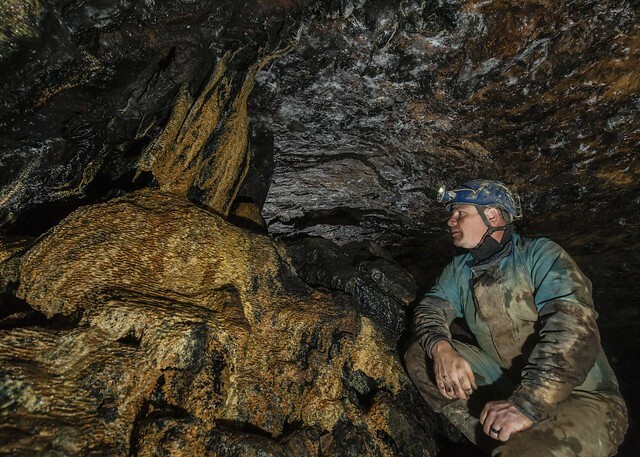 After such a successful and pleasant first trip we could only be disappointed by our next trip as we headed only a short distance away to visit a cave on the opposite side of the A470. We changed and headed up the hill past the Cil Sanws quarry where Ogof Cil Sanws emerges in the quarry face, and then up onto the top where the footpath skirts the Merthyr Golf Course. We arrived at the large rectangular shakehole with a pile of massive blocks in the bottom. 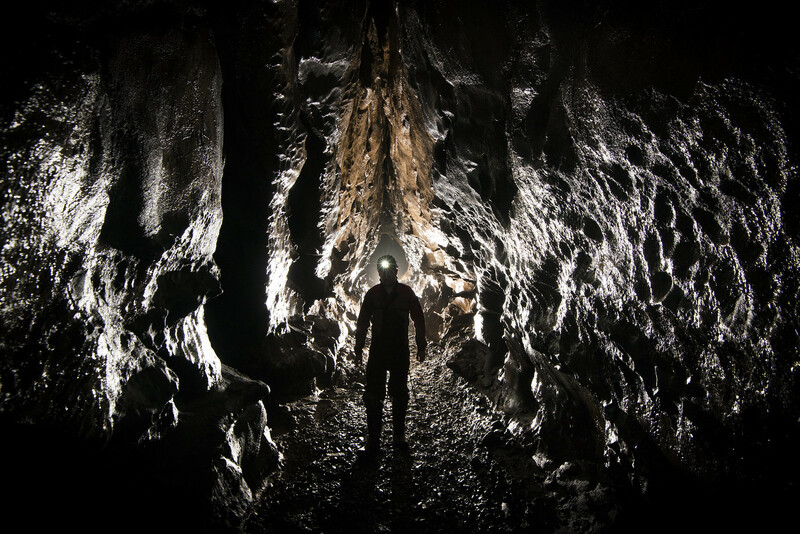 A scaffolded section in the corner leads down into a void below the giant rocks above. The route was fairly obvious as we twisted and turned making our way deeper and deeper into the boulder choke. After a while we broke out into the side of a large chamber, the floor of which was covered with large blocks, with more blocks peeling away from the roof ready to join them. From the chamber we dropped down over blocks into a short section of passage before a further drop down through boulders took us into a passage with some fine mud deposits in. The passage was followed over some long flat-out sections in a wide passage to eventually reach a larger area with two ways off. We headed along the left branch crawling flat out over many fallen roof slabs to eventually break out into a fine chamber with old stals in the roof and floor. Following around the chamber to the left took us to a drop down into a further passage that was followed getting lower and lower to eventually reach a draughting hole in the floor. Not being too sure how easy it would be to get back up the hole only Keith dropped down this to follow a keyhole passage to a chamber with two low sandy crawls going off. We then returned taking a few photos as we came back out. The mud stuck to everything and the flat out crawls ensured we were plastered head to foot. All that lay ahed was to find our way back up and out of the suicidal entrance choke. A total contrast to the first trip of the day, but after this was Caving Hell. As is now our annual tradition Jess and I arranged to take Chloe on a birthday adventure. An email was sent out to see if anyone else fancied a play in North Wales and Mark B...U...R...G decided to join us. 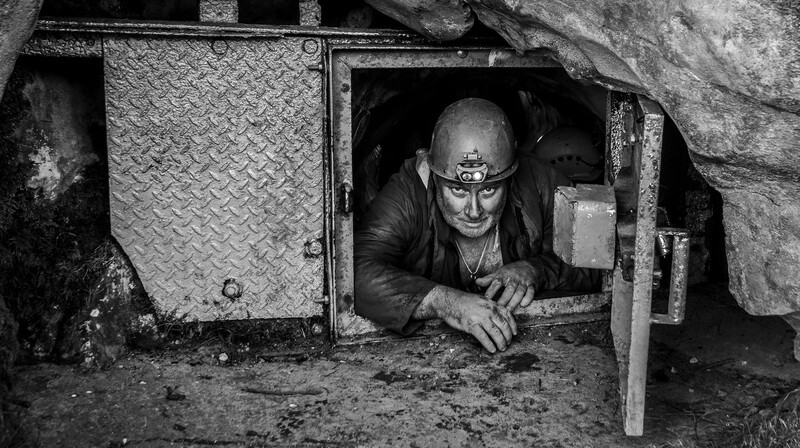 We met at the car park above Tanygrisiau and were soon surrounded by 20 familiar faces from South Wales Caving Club who were off to Cwmorthin Slate Mine. We had a quick chat, with Mark2 giving some route advice, before we kitted up and headed up the valley. After some huffing and puffing we arrived at the Croesor entrance and took a minute to pop SRT kits on. At this point I realised I'd left my gloves back at the van, If only this turned out to be my only faux pas of the day. After an amble down the entrance series I began positioning my 5 flash guns for the first of many exciting shots of this fun through trip.... 'Click!'... I got a feel for how I would take my shot so called Jess to hold a flash gun.....after this my camera refused to play and upon closer investigation it turned out I hadn't charged the batteries....Doh! The rest of the trip went without issue with lots of fun had at the various zip wire, bridges, traverses and boat rides. 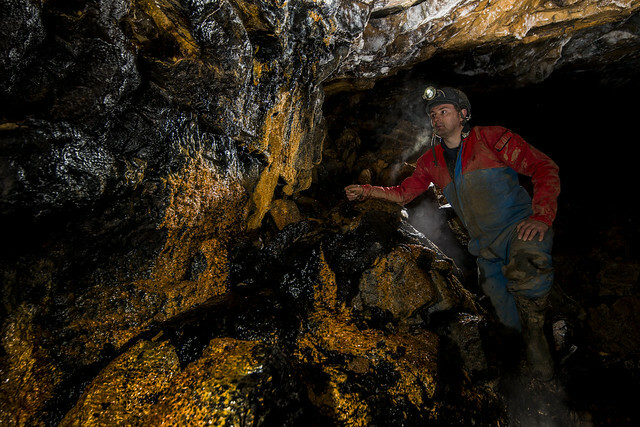 An excellent choice for a birthday trip and definitely a piece of mining heaven. After visiting Little Neath River Cave last year Mike and Lucy suggested a visit to the other caves lower down the river, and so we planned our day along the Little Neath River. After the obligatory breakfast at Luigis (nearly brought back up by Lucy as we took a diversion along some precipitous roads to avoid the closed Clydach Gorge) we headed to Nedd Fechan and parked up close to Bridge Cave. Our first cave of the day was Town Drain where we headed down to the squalid end, and then returned via the crawling entrance to emerge directly opposite our second cave of the day - White Lady Cave. We entered via the main entrance and took some video as we went in. Some playing about in the sump pool followed before we headed up the higher branch to reach the duck. Mike made several passes through it for the video before we exited into the gorge where we chased the fleeting suns rays warm up. A little time was spent exploring the different entrances to the dry cave and the not so dry passages close to the sumps. We found that the low passage into the Pwll Y Rhyd EXtensions was too slited up for us to get in. A few 'through' trips were completed between the many entrances before we headed back up towards Bridge Cave. 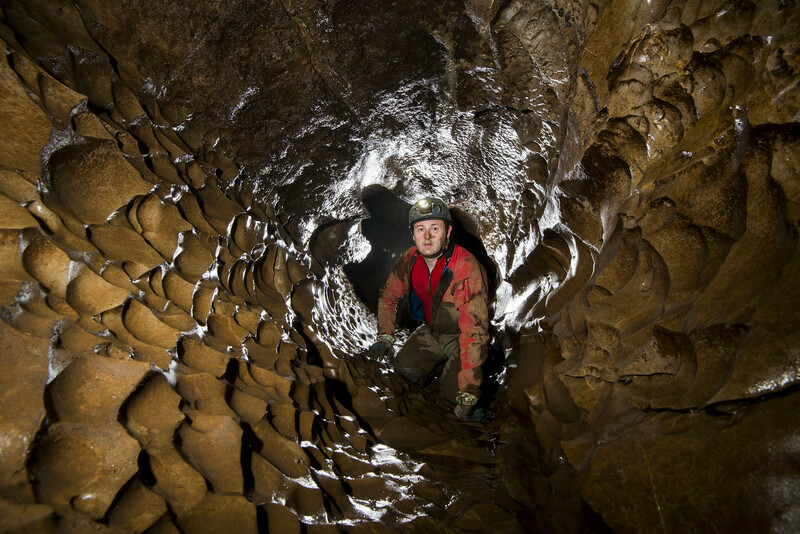 A very ordinary visit to Bridge Cave which included exploring all dry passages to the sumps before a return to surface. The oh-so imaginatively named "Cave Under The Car-park" would be our finale for the days caving. 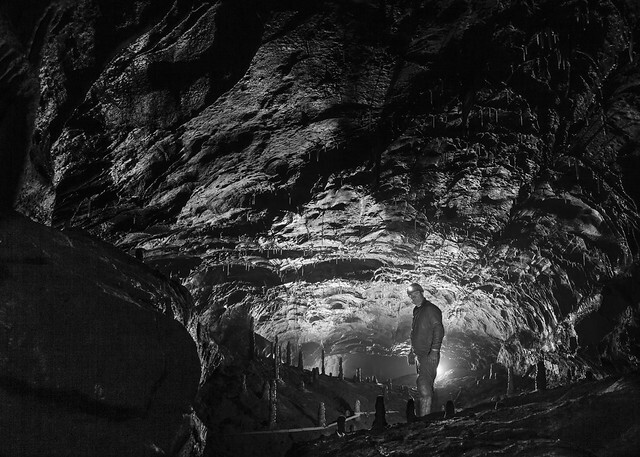 A cave never visited by us before and one that may possibly have collapsed a little since it was dug out by the Westminster S.G, we entered with a little trepidation. Located in the the opposite side of the shakehole to Bridge Cave, it started off as a quite pleasant crawl, but soon degenerated to being flat out over cobbles. After a short distance a small chamber was entered and after poking our noses in the higher level leads it became clear that the only possible way on was the low flat out crawl through cobbles and boulders. This continued for a couple of body lengths before it turned left and another couple of body lengths took us into some larger passage. Now the roar of the Nedd Fechan sinking could be heard and we passed through some wider passage with sharp rock protrusions to a large flat slab that we slid over. On the other side we gained a small chamber where the Nedd Fechan entered and went down a steep passage to the sump on the right. The way on was clear as daylight streamed through an entrance blocked by driftwood and a multitude of spiders and their webs. We fought our way through the debris to emerge into daylight. 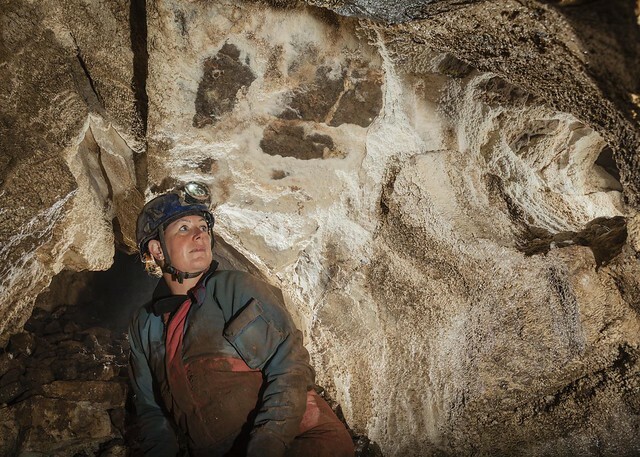 The Wells Museum hosts the now annual Mendip Cave Photography Competition. 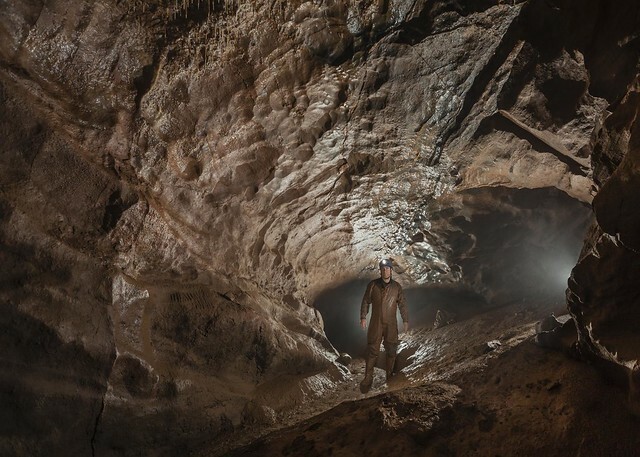 The field is open to all cave photographers who submit photos of Mendip Caves. 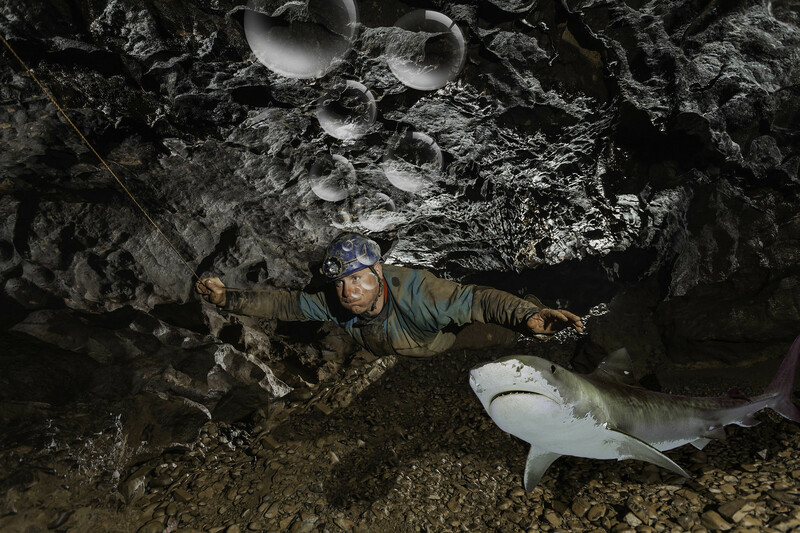 This year saw about 20 photographers enter a total of around 100 photos that have been displayed at the Wells Museum. 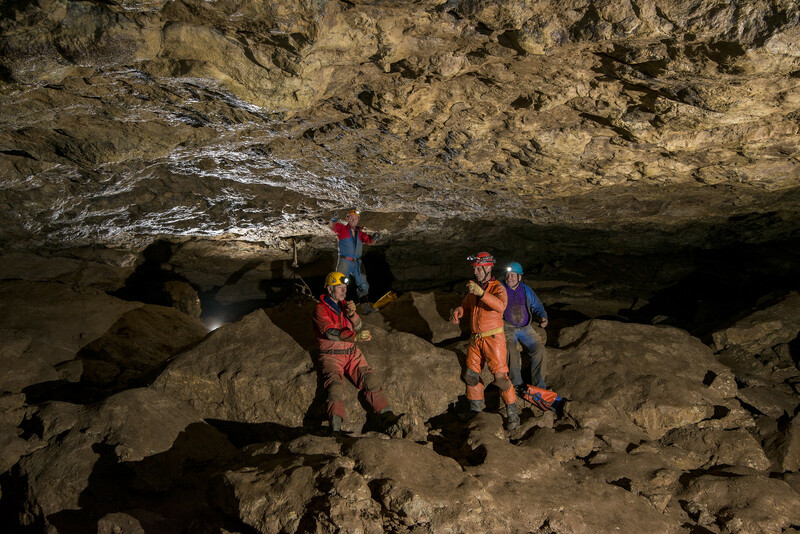 On the evening of Friday 5th June the great and good of Mendips caving scene (and a trio of reprobates from the Midlands) gathered in the Wells Museum to view the photos and see the presentation of the winning entries. 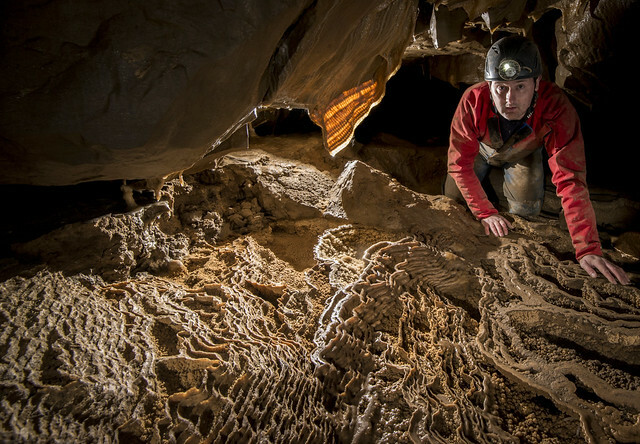 In Third Place was Stu Gardiner with a shot in the entrance series of GB Cavern where he caught a great reflection of Lucy Greenwood in a puddle she was crawling through. 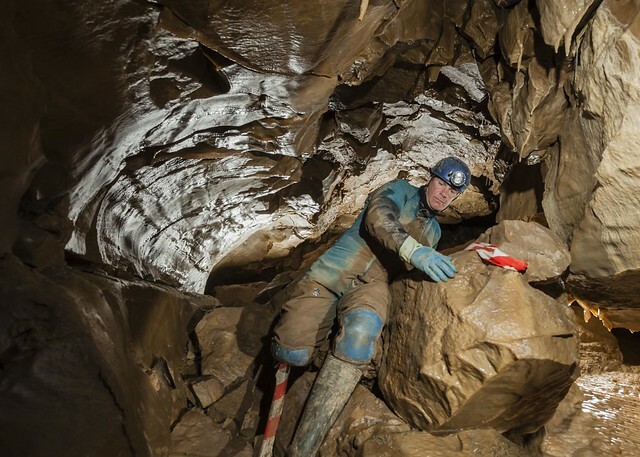 In Second Place was a new caver - Duncan Simey who had a great set of photos from Swildons Hole, with this fantastic shot of the Landing scooping him the runners up prize. 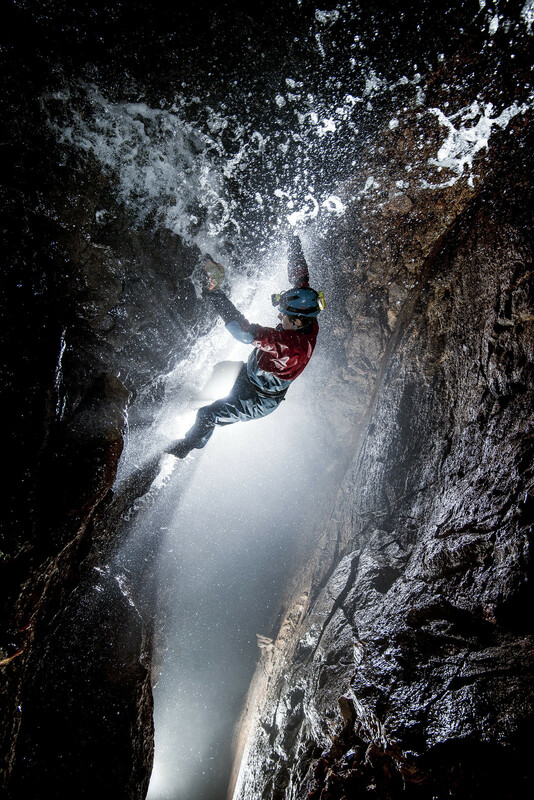 Mark Burkey Who stole the show with his very atmospheric shot of Loz climbing up the lower section of the Swing Pitch. 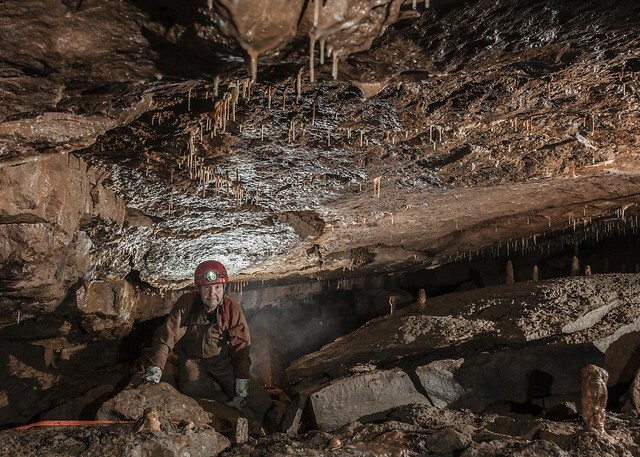 The judges were looking for well composed, technically perfect shots, but more importantly photos taken that gave a different perspective on all too familiar parts of the Mendip caves. The photo of the landing and Mark's winning shot both ticked this box.